Continued discussion on a proposed pilot program for “parklets” in the city, which had been tabled to get more resident feedback, is the highlight of the next Safety Harbor City Commission meeting on Monday. The 7 p.m. meeting will be preceded by a meeting of the city’s Audit Committee at 6:30 p.m. The Audit Committee, which includes all five commissioners and two appointed residents, will get a presentation from external audit firm CliftonLarsonAllen LLP. Here’s the link to the full agenda for the City Commission meeting: http://safetyharbor.granicus.com/GeneratedAgendaViewer.php?view_id=6&event_id=1617. Additional material, known as “backup,” is available via the hyperlink on each item. What is it? Andy Greenwood, a member of the Planning & Zoning Board, suggested several months ago that Safety Harbor look into starting a pilot program for “parklets,” which have become quite popular in many cities around the country and the world. A parklet is a public space built in existing public parking spots on main roads, becoming essentially a mini-park, often with creative and unique themes. While they are located in front of private businesses, they are open to the public, just like a public park would be. The proposed pilot program would allow any individual, organization or business that wishes to build a parklet at their expense and to the city’s specifications to apply, with a limit on how many would be approved initially during the pilot phase of the program, after which Commission could decide to continue, end or change the program. Greenwood presented his idea to Commission in October, after which Commission directed city staff to draft a pilot program. After reviewing parklet programs in a number of cities, city staff presented its proposal at the Feb. 19 Commission meeting, at which time commissioners indicated they wanted more public input before deciding how or if to proceed with the pilot program. The city created and publicized an email address for public comment, but received no emails. 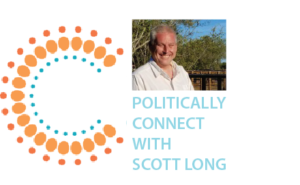 However, a number of residents share their comments on various social media posts. What’s the issue? Parklets add additional amenities to the city for residents and visitors to enjoy at limited to no cost to the city. 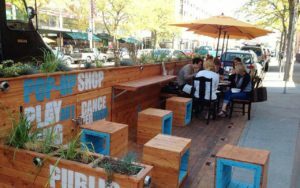 Depending upon the design of the parklet, users can sit and read a book or enjoy conversation with friends or, depending upon location and additional approval, they could be public extensions of private establishments, like bars and restaurants, which would allow users to enjoy a drink or a meal on them. Safety Harbor would be one of the first local cities to allow parklets, adding to the uniqueness of the city. Concerns raised include that each parklet would take up two existing parking spots along Main Street, safety issues for users and for drivers and the city’s liability to parklet builders if the pilot program is ended early, as the cost to build a parklet is estimated to be between $10,000-$20,000 each. Fence requirements: This would ban chain-link fences in downtown front yards except in industrial zones, extend a ban on chain-link fences to include vacant lots in residential zones, ban gates that block sidewalks when open and limit fences, hedges and walls on busy downtown roads (known as “arterial” or “connector”) to four feet in height. Outdoor lighting: This provides some general guidance on the use of outdoor lighting, including that lighting be faced down and not on to adjacent properties, as well as banning rope lighting except for string lights during the holiday season from Nov. 1 to Jan. 31. Also, building permits will need to include a lighting plan. Update to Capital Improvements Element: The city needs to update its long-range goal documents annually, and this is one of them, reflecting changes to the city’s Capital Improvement Program. FY2018 budget amendment: Any time revenues or expenses shift after the budget has been approved, those changes need to come back to City Commission for approval. This item reflects the $160,000 in parkland fees that is expected to come from the Bay to Bay Properties development at 2nd Avenue North and Main Street that will be used with a transfer of $200,000 from reserve funds for improvements at Waterfront Park, as well as revenue from site plans that are removing trees that will be used to plant new trees on Main Street. Sidewalk waiver request for 1096 3rd St. North: The property owner is building a single-family home, and the city’s land development code requires a sidewalk to be built the entire length of the property, unless one or more conditions are met. City Arborist Art Finn determined that an “existing natural condition” exists, as adding a sidewalk along 11th Avenue North would negatively affect the roots of a live oak tree. Another bad idea for Safety Harbor, eliminate more available parking downtown by installing wooden seating areas where people can sit while eating and drinking. Does the city plan to keep these clean? when people walk off leaving their half eaten food and cups of beer behind is there going to be someone to clean up after them? I can only imagine what that wood is going to look like after a few years sitting out in the weather. Sorry, Safety Harbor is not San Francisco, Portland, Seattle, Paris, London etc etc…..Stop trying to make a name for yourself by trying to improve something that doesn’t need improvement. Give the Parkletts a chance. What is at risk — two or three Main St.. parking spots that are rarely used anyway except on ‘event days,’ transformed for a few months as citizens give it a test drive? And personally, I’d like to believe citizens and visitors have enough personal pride (and peer pressure) to police litter. I like the idea of SH considering new ideas and a different way of thinking. Try it… you might like it. Then, if most people do not, one haul to the dump and problem solved. I think that Safety Harbor should implement the parklets program on a limited basis and see how it works out. It may be a big hit or not, but we will never know unless we try it out. At least the parklet idea is a creative idea that can help re-invigorate our downtown streets and Safety Harbor should embrace new creative ideas. I think the city should try two or three of these parklets for 6 months to 1 year and see if they help bring more people to enliven our downtown and encourage people to patronize our many restaurants and businesses. What’s the backstory on the outdoor lighting restrictions? We don’t live downtown, so I’m wondering if we’ve missed some problem that’s developed. Otherwise, it sounds like Code Compliance is going to be sending out violation notices to residents with lights strung up on their patio, which strikes me as excessive. JB – I had the same thoughts. Is this related to Main Street or all of Safety Harbor? And what is considered a “rope light”? This item needs further clarification. I’m a big fan of the parklet idea, and would love to see it implemented in Safety Harbor. I firmly believe that we don’t have a parking problem, for those willing to walk a couple blocks to their destination. Lets try the parklets and see if they truly benefit the welcoming feel of our town. I think they could be a very big benefit to the charm of Safety Harbor. Are stores/restaurants interested in having these in front of their business? If merchants are in favor, I think it’s worth piloting. When we have beautiful weather, people are always looking for a place to sit outside with friends and pooches to enjoy conversations, drinks and munchies. I am in favor of fewer parking spots on Main as long as the city provides enough parking options within a block or two of Main. Will the City be able to disassemble and store these when the next hurricane threatens our area? I am in favor of fewer parking spots on Main Street. I believe we should start thinking about parking meters and parking on side streets this will bring extra revenue for the City , The businesses on Main Street will do so much better financially and it will bring businesses on the side streets. Then if you want to consider the Parklet idea it sounds better to me. Who is responsible for the cleaning/sanitation of these parklets? I think Main Street should become pedestrian only from Bayshore to 5th! Put some parking lots or garage somewhere on the outskirts. Get the cars out of the city center, increase foot traffic, host events, improve safety, and make the area cleaner. 😀 would solve parking plus public space issues!!! First the negative then the positive. Sitting on a hard back-less box is not my idea of comfort. Anything wood will not last either. Like the benches, bad idea. Sitting outside on a nice day or evening to eat or drink is a great idea & the merchants could benefit. As a pilot program, & comfortable chairs, I vote yes. Regarding the fence restrictions, I’m curious to know what they consider downtown. I’m one block north of three downtown restaurants. Does that mean my fences have to come down? What exactly are the boundaries of downtown? Don’t limit parklets to the east end of Main Street, but keep in mind the restaurants and shops west of 5th St, who would love that amenity to promote their businesses as well. Like across from the City Hall. Sorry, but with the taxes I already pay it seems to me our little community has a spending issue not an income problem. We don’t need parking meters unless we want to drive away people from downtown. Check what Dunedin has done. Last I noticed they removed the credit card meter system because merchants complained they were driving away business. I for one haven’t been back since being stung for parking. Why can’t we fix a little curb issue at SR590 and Main St. on the southwest corner. It’s dangerous to not be have a wheelchair or bike friendly crossing at that intersection. Let’s face it we will always have parking issues as long as planning doesn’t require property to provide parking like across from city hall and 8th Ave. Pub. Don’t even get me started on the shameful monstrosity being developed on Bayshore behind Fly Bar. Don’t get me wrong I’m not against development, only out of control in the pocket of developers. I believe parklet dining platforms are a bad idea and desperate attempt to gain some much needed sidewalk space because we have problem with public right of way on sidewalks in front of some businesses. Is anyone sure we won’t have a rat infestation on Main with these platforms? Define a parklet: “space for use by the public”. When is a parklet NOT a parklet?—-when it is intended as an extension of the bar/dining room for a business who will invest $20,000 for this space, including permission to serve food and alcohol to make it more serviceable. Why else would a business invest this kind of money—– for a deck and chairs? Never. So what we are seeing is 3 “parklets” for the use of these businesses, and the general public gives up 6 parking spaces (more probably later) so restaurants and bars can expand? Don’t call these “parklets”, call them “business bump-outs”. Who asked for these? A true parklet is the one in front of Tupelo. And do we want to sit out there in the 93 degree sun for 6 months out of 12? Find another way to clear the sidewalks. Before we start blocking off Main St. and spending maybe 60K or more for business benefit not the public why not spend that money on the waterfront with maybe a drive around the Spa connecting each end with angle parking starting with one way only. Then if it works out add another set of angle parking on the other side of the drive around. Maybe enlist the Spa to enhance their exposure to the waterfront with a nice walkway down to the Park. After all they got a pretty good chunk of dough for that waterfront they weren’t using. Hey and with all the events the city sponsors we could use the bare dirt on the north side of the Pier restroom after we get a good rainfall and sponsor mud wrestling events. Why does the current plan tear down the existing restroom? Why not add a restroom at the north end of waterfront park? Speaking of Parks and adding to Helene’s thoughts I agree we have Parks that get very little use already Winter or Summer. Encourage businesses to cater to the park goers where we already have facilities if people want to be outside enjoying the pleasant weather. Call ahead for service or use Uber or a different type of start up service. I say there are a lot of ways to promote the downtown without spending my or our tax dollars on bad ideas to benefit a few and poor results. Seriously, just kidding about the mud thing. Let’s forget about the Parklet thing and ask businesses to clean up the side walks they already use. They might be surprised with a clean storefront more business could come their way. I hope the chain link fence issue isn’t targeting kiddy corner from the Post Office. If it is shame on you.